Empowering and enabling small businesses are a priority of the administration’s economic development agenda since President Rodrigo Roa Duterte assumed office in 2016. In support of the President’s commitment to the development of micro, small and medium enterprises (MSMEs) in the country, the MSME Development Council (MSMEDC), through the Department of Trade and Industry (DTI) as MSMEDC Chair, is staging once again the National MSME Summit 2018 on 10 July 2018 at the ASEAN Convention Center located at the Clark Freeport Zone, Pampanga. “This Summit will be a venue for our MSMEs, the backbone of the Philippine economy, to become more innovative and competitive in their businesses. With the continued support from both government and private sectors, we are enabling MSMEs and generating inclusive growth,” DTI Secretary and MSME Development Council Chair Ramon M. Lopez said. With the theme “Accelerating 7Ms for Competitive MSMEs,” the Summit will present various opportunities and initiatives in gearing up for MSME competitiveness under the 7Ms framework which was introduced and supported by the ASEAN Economic Community (AEC) on 14 July 2017, in line with the country’s hosting of ASEAN. 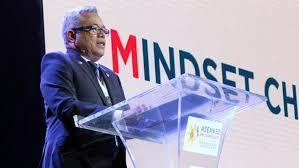 The 2017 ASEAN Summit has issued the Manila Call to Action (MCA) for MSME Development, carrying a more MSME-centric perspective with its 7-point framework aligned to the following elements of an entrepreneur’s journey, known as the 7Ms – Mindset Change, Mastery, Mentoring, Money, Machine, Market Access, and Models of Business. Through 7Ms, MSMEs shall be assisted to develop a positive Mindset, to gain Mastery of their business, to provide quality business Mentorship, to facilitate access to Money, to improve access to domestic and international Markets, to provide quality Machines, and to be exposed to innovative Models of business. “The MSMED Council, with DTI as its Chair, is focused on cultivating a vibrant entrepreneurial spirit among Filipinos. We are enabling our MSMEs to be innovative in their products and services to be able to compete in the local and global markets,” Secretary Lopez added. President Rodrigo Duterte is expected to grace the Summit as a show of his administration’s continuing support to MSMEs. Prominent industry leaders, youth, women entrepreneurs, and trailblazers are attending and speaking during the summit, sharing their expertise and even networking with entrepreneurs. The Summit intends to gather 800 participants that consist of entrepreneurs, academe, enablers, business experts and other stakeholders nationwide. The attendees will gain fresh insights and inspiration from resource persons who are experts in their respective fields.